The myth of an international Jewish communist conspiracy has long been a central diet of anti-Semitic agendas, most notably in Hitler's program of ideological genocide. But equally many authors not influenced by anti-Jewish agendas have suggested that conservative fears of Jewish Bolshevism possessed some legitimacy. The Dutch academic Andre Gerrits provides a dispassionate and balanced account of this contentious topic. Gerrits acknowledges that the equation of Jews with Communism contains a small element of truth. From about 1870 till at least 1970, Jews were conspicuous for their involvement in socialist and communist parties and movements. The Jewish alliance with the Left reflected a number of complex historical and political factors including the class oppression of Jews who were mostly poor and working-class, the ethnic/national oppression of Jews by various European right-wing governments and movements, and the defence of Jewish claims to equality by most left-wing European parties and movements. But equally many of the Eastern and Central European communist movements to which Jews belonged in disproportionate numbers were very small movements. The small minority of Jews involved were not representative of Jews as a whole. The Jewish contribution to Communism fuelled anti-Semitic conspiracy theories such as the Protocols of the Elders of Zion alleging that Jews control or manipulate the international communist movement in order to rule the world. But as with other racist frameworks, the Judeo-Communist myth is based on an anti-Semitic construction that exists independently of any objective reality. It is not about what Jews actually say or do, but rather about what anti-Semites falsely and malevolently attribute to them. The myth reflected a notion of collective Jewish guilt similar to that of the blood libel. Gerrits attempts to separate the myth from the reality. He considers the lack of reliable empirical data on Jewish Communism, and raises four key observations. Firstly, Jews were not the only ethnic minority over-represented in European Communist parties between the two world wars. So too were Georgians, Armenians and Latvians. Secondly, Jewish participation in Communist parties varied from country to country, and was not universally significant. For example, there were few Jews in positions of influence in the German Communist Party. Thirdly, it was not only the number of Jews but also the prominence of some Jews in leadership positions including state security organs that captured popular attention. And finally, the prominence of Jews in Communist parties tended to decline quickly once Communist rule was established. 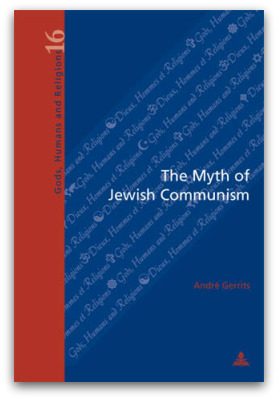 Gerrits notes that the Judeo-Communist myth was strongest in those European countries — Poland, Hungary and Romania — which had large Jewish minorities, strong traditions of popular anti-Semitism, and a credible fear of Russian expansionism associated with an alleged potential for Jewish collaboration with Russian aggression. He identifies two key historical periods in the development of the myth. The first was immediately following World War One when the visible rise of the Jews from the margins to a prominent role in professional and business life coincided with rapid social and political changes and upheaval. The prominent role of individual Jews such as Trotsky and Bela Kun in the Russian Revolution and other radical uprisings was widely noted. The second was the arguably key role played by a number of Jewish Communists known as the 'Muscovites' in the Soviet takeover of Poland and Hungary following World War Two. Gerrits rejects conspiracy theories that Stalin deliberately placed Jews in leading positions to serve as scapegoats for any public backlash against Communist rule. Instead, he argues that they were chosen not because of their Jewish background, but solely due to their political reliability. Gerrits also addresses other major issues such as the later purging of most of the Eastern European Jewish Communists by Stalin, and the associated emergence of Communist anti-Semitism as a political tool in the Soviet satellites including the tragic 1968 expulsion of over 20,000 Jews from Poland. He also comments that the Judeo-Communist myth had little impact in post-1945 Western Europe or the USA despite the prominence of some Jews such as the Rosenbergs in the Cold War spy trials. Today, the Judeo-Communist myth is fortunately dead except for tiny groups on the paranoid far Right. But its long-standing destructive and genocidal impact should serve as a universal warning of the dangers of demonising or essentialising whole peoples or groups whatever the actions of individual members. Associate Professor Philip Mendes teaches Social Policy and Community Development at Monash University, and is the co-editor of Jews and Australian Politics, Sussex Academic Press, 2004.
gerrits is an ignoramus. i refer anyone to red alexander's wat 'my century'. What an interesting choice of book to review! It appears to me that there were indeed Jews, individuals and small groups albeit, that belonged to Communist parties. Knowing the hearts and minds of all Jews is impossible, so one must concede that the number of Jews who shared Communist beliefs and hopes were more than we actually know about. The myth of Jewish Communism is most easily debunked by a single fact: Jews are as diverse as they are dispersed, there is no unifying body, institution, organisation, secular or religious belief that can offer Jews any sense of unity beyond their humanity.